Well I quite like it really, after looking on Twitter I am not sure how many people do. I like the fact it really gets across the passion and inspiration of teaching in an interesting way, I like the fact that it is using real teachers who love what they do and are happy to be part of this billboard campaign. I accept parts are slightly cheesy and nauseating at times especially to those outside of teaching but isn’t that what it is a bit like working in schools? Of course the main gripe is that this advert is misleading with regards to the salary of £65K which has already initiated a complaint to the Advertising Standards Agency as reported in Schools Week. However are we really surprised and shocked by this? Doesn’t this happen often in advertising? Have we forgotten that this happened previously back in 2008 if you remember when the TDA advert was actually banned for misleading salary figures. My main issue with this advert and the subsequent fall out over misleading figures is that it now distracts people from the main thing which is recruiting more teachers. I think the advert does show that the government are taking the recruitment crisis seriously. That is if there really is a recruitment crisis in education? However this report by Schools week on the stats does raise some serious questions that need to be answered, anyone in a school will surely have found that they are struggling to recruit or beginning to in some areas I know I have found this to be the case. This has also been reinforced this week in the news about the rising cost of supply teachers in schools and also reports that many supply agencies can’t meet the demand. I have enjoyed reading the post by Ross @Teachertoolkit in response to the recent advert and share his concerns however I think that the Get Into Teaching site by the DfE is a fantastic place for people to go to explore a career in education. The video tutorials that have been created which are also interactive are great and I think the DfE have done a good job on this and this surely will help move things along. However the perhaps bigger issue to address is the challenges raised in the recent ITT review by Andrew Carter. What are we doing to overcome these? What can we do in school to address this? So what do Teachers Make? 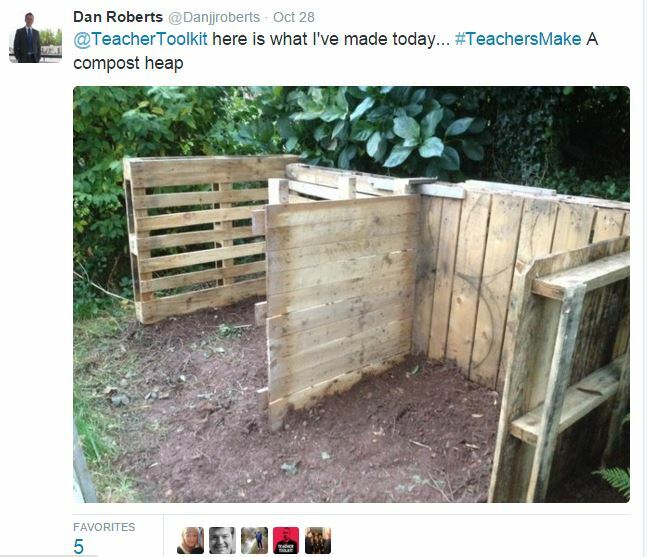 Have a look at #TeachersMake to see the debate, I know this week I made a compost heap and Ross @teachertoolkit made some milkshakes. However I have been on holiday so I have an excuse but of course I have maintained some school work, writing UCAS references, catching up on emails, supporting students help requests, reviewing action plans and performance management targets to name just a few (No marking as I have no classes at the minute – sorry!) but I wouldn’t change this job for anything, I love it.